Registering a pet with the NMPR gives you peace of mind and many benefits. We will provide you with your very own Members Area which allows you to keep your registered pets updated and managing all aspects of your account with us. You can access your members area at anytime, day or night. Registration is very simple and you are not just limited to the one pet, you can register up to 5 pets at your contact address and each pet will be issued its own unique NMPR PetID.This allows you and any other members to instantly know that the pet is missing and on the UK Pet Register. 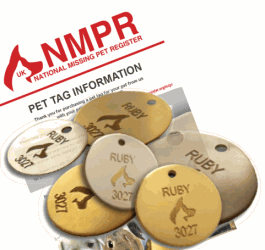 NMPR pet id ideal for Registering a dog and register a cat. At the UK Missing Pet Register we provide your pets with a unique PetID tracking code which you then provide your pet. This unique PetID code will allow anyone who finds your pet in the event it is lost, to notify us and we will put you in contact. With such a large community at the Pet Register, you can be safe in the knowledge we will do our utmost to bring you together. We are not simply just a pet registration database, we provide you with your own control panel to keep your pet information updated and current. You have 24hr access to your control panel via your username and password we supply in your welcome email. In the event your pet is missing, login and mark your pet as missing, this will activate the NMPR PetID to be searchable on our dedicated website at www.petreg.org and display your emergency contact number to the finder. You should also place your pet on our missing pet register which will alert other members that your pet is missing We do not display any private information about you on our website, only the information you supply for your lost pet listing and emergency contact number is displayed. The registration process for your pet is very straight forward. All you have to do is create an account at the UK National Pet Register and then you can add your pets to the database and be issued a PetID. You will need to provide certain information to register an account; this is to ensure that in any event that may arise regarding your pet whereabouts so we are able to contact you.